Nestor Ramos with his trusty bodyguard (aka Globe reporter Steve Annear), getting ready to eat President Trump&apos;s preferred McDonald&apos;s meal. I am no stranger to the concept of a late-night fast-food run. Show me a wife out of town for a couple days, and I’ll show you at least one shameful visit to the Wendy’s drive-through by my house. So, far be it from me to criticize President Trump for dispatching a trusted former body guard, Keith Schiller, to a nearby McDonald’s to procure a presidential burger, as reported by Politico on Tuesday. I won’t abide a well-done steak — another reported Trump delicacy — but this? Well, this sounds like something I’d do. But then I heard the president’s preferred Mickey D’s order. A quarter-pounder with cheese, extra ketchup, hold the pickles. And a fried apple pie. All jokes aside — have you ever noticed the suspicious similarity between a Big Mac’s secret sauce and, ahem, Russian dressing? — this sounded like a bad order. Too sweet, lacking anything appropriately salty or sour to balance it. And an ill-considered fast food order, as anyone who’s gone rogue in the Burger Kingdom knows, is a tragedy — a waste of hundreds, even thousands of precious calories that had been allocated for something full of delicious chemicals. The president’s order? A quarter-pounder with cheese with extra ketchup, no pickles, and a fried apple pie. Why do you think people get so furious when they discover they’ve gotten the wrong sandwich in their bag after they pull away from the window? But I had to give the president’s order a fair shake. 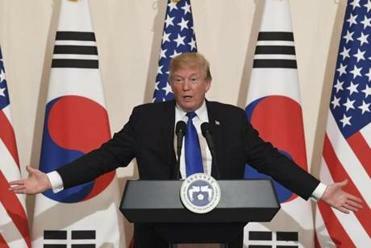 I deputized a trusty accomplice, who appears to subsist entirely on protein bars and Polar seltzer, as my bodyguard for the day and sent him off to procure the Trump special. “Do I need to order it fried? Or is that just how they come?” my deputy asked of the pie. He had not passed under a golden arch in about a decade (though he did drive all over greater Boston eating gas station hot dogs with me). “Order it fried, to be safe,” I said. He walked over to the McDonald’s in Downtown Crossing — less than a half-mile from the Globe, about the same distance as the New York Avenue location that Schiller reportedly raided for his boss is from the White House — and procured the $6.41 worth of goods. 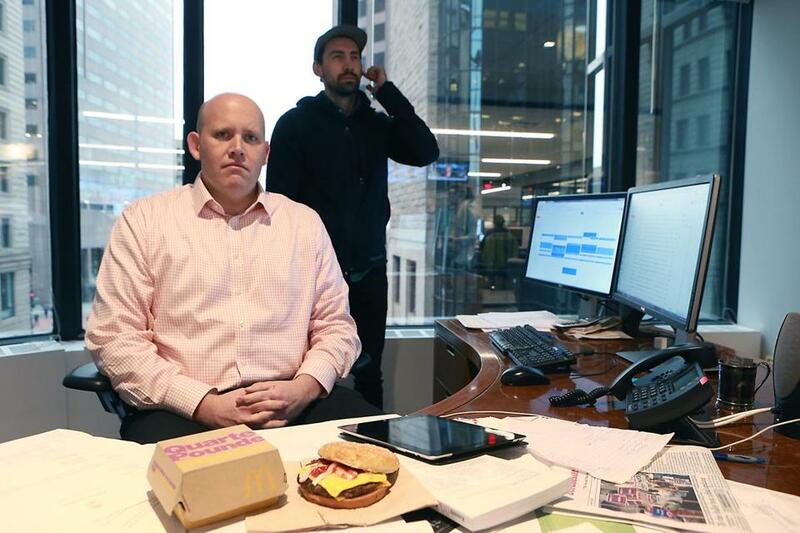 To complete the Trump burger experience, we commandeered the fanciest office we could find (aside to Brian McGrory: I’m sorry about the lingering smell) and got down to business. President Trump's preferred McDonald's meal. A visual inspection revealed the burger to be much as I remembered a quarter pounder: a seeded, slightly stiff bun with a thick, uniform beef patty cloaked in yellow cheese on both sides. But removing the top bun revealed a pool of ketchup that looked like the set of a “Saw” movie. After the first bite, the ketchup began oozing out of the mouth-shaped gash I’d left in the burger. 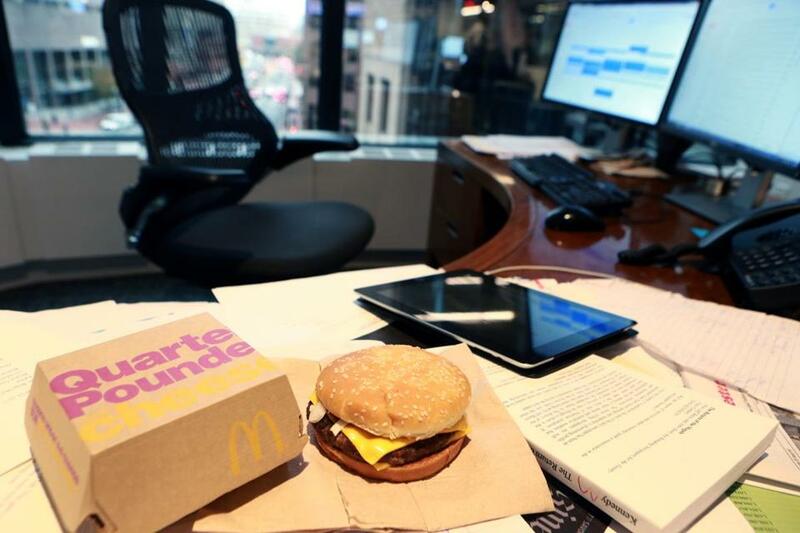 In fairness, I have had very little sugar since concluding my Whole30 diet, but sugar was all I could taste — blindingly sweet, with a faint hint of that unique beef-adjacent flavor that all McDonald’s patties acquire somewhere on the winding journey from cow’s body to person’s face. The second bite was much the same, at which point I gave up. There were onions in there, but they were drowning in ketchup. Rumors of cheese remain unconfirmed. This isn’t a burger, it’s a ketchup sandwich with extra meat. And the pie? Well, I couldn’t test the pie. The location in Downtown Crossing serves only the vastly inferior baked variety. And though my noble deputy asked, the staff declined to dump an already baked pie into the fryer. Sad. But that pie could be lovingly hand shaped and carefully fried in virgin duck fat by Thomas Keller himself and it wouldn’t redeem that ketchup-soaked burger. And come on, how do you skip the fries? Say what you will about McDonald’s: The fries are unimpeachable. Nestor Ramos: Whole30 promises to reset your WholeLife. Does it?